Vitamin E is renowned for its effectiveness in skin health as well as acting as a powerful antioxidant. 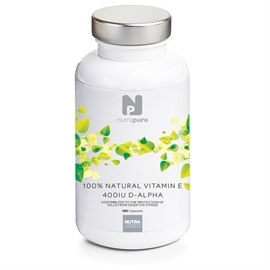 Nutrapure Vitamin E 400iu is 100% Natural Vitamin E 400iu D-Alpha and contributes to the protection of cells from oxidative stress. Vitamin E is renowned for its antioxidant properties that help support skin, hair and eye health, whilst naturally slowing the ageing process. Vitamin E is a fat-soluble vitamin making it better absorbed by the body when taken with food. It acts as an antioxidant in the body. Antioxidants help prevent free radical cell damage. Free Radicals are cells that wreak havoc and destroy healthy cells in the body causing (for instance) premature ageing and disease. As a fat-soluble vitamin, it helps prevent free radical cell damage to specific fats in the body that are vital to health. Vitamin E has been shown to be beneficial in helping to strengthen the capillary walls in skin and to improve skin’s moisture and elasticity, acting as a natural anti-ageing nutrient within your body. Vitamin E’s antioxidant properties helps to decrease environmental damage to hair; promote circulation to the scalp and can help retain the natural moisture in your skin, which will help prevent your scalp from becoming dry and flaky. Hair will also look healthier. Vitamin E may help reduce the risk of age-related macular degeneration (AMD) - a common cause of blindness. This is a perfect example of how this antioxidant can help slow down ageing cells. Helping slow down ageing naturally does not just mean ‘anti-ageing skin care’ but age related conditions caused by damaged cells within the body. But in order for vitamin E to be effective for vision, it must also be taken with vitamin C, beta carotene, and zinc. There are in fact 8 sources of Vitamin E, but only D-Alpha Tocopherol is considered to be the most bioavailable form due to it being better absorbed by the body. Specific transport proteins in the liver seem to connect better to ‘natural’ vitamin E, enabling it to be carried to other areas in the body to be used for important functions such as, as an antioxidant. This is why Nutrapure Vitamin E 400iu is 100% pure D-Alpha Tocopherol, to ensure you feel the maximum benefit. Is Nutrapure Vitamin E 400iu Right For Me? Though available in supplement form, vitamin E can be found in many foods including plant oils, nuts & seeds, poultry, eggs, fruits, and wheat germ oil. If however, these sources are not incorporated into your diet, then the supplement form may be of benefit to you. Vitamin E has been shown to be an effective anti-ageing antioxidant. If you suffer from poor hair health or poor skin health including acne or eczema, then Vitamin E could help restore them. In order to help reduce the risk of age-related conditions such as AMD, or inflammatory conditions caused by free radical cell damage such as heart disease then this powerful antioxidant is ideal to help support overall health and wellbeing. Vitamin E is one of the few fat-soluble vitamins that cannot be stored by the body for any length of time; because of this a regular supply is needed. There are several forms of this vitamin, although alpha-tocopherol is the most powerful one. Vitamin E is a potent antioxidant, and has especially strong effects in the skin - preventing the ageing damage caused by free radicals, protecting the skin from other forms of damage like pollution and sun exposure, and is especially good at healing scar and wound tissue. Vitamin E also exerts powerful effects inside our bodies. It may help prevent and dissolve blood clots, can alleviate tiredness and improve stamina, reduce blood pressure and recent scientific research also shows that it may have value in lowering the risk of heart disease. The Nutrapure Vitamin E 400iu Difference - What Makes Nutrapure Vitamin E 400iu Better than Other Vitamin E Supplements? Sourced from natural vegetable oils for maximum bioavailability. Recommended by our health experts Nutrapure Vitamin E 400iu has been developed by clinical healthcare experts. The ingredients have been carefully formulated with research to ensure they deliver results. Nutrapure Vitamin E 400iu is also recommended by nutritionists. Vitamin E Natural 400iu (D-Alpha Tocopherol Succinate) (268.4mg), Capsule Shell: Vegetable Cellulose 100mg, Rice Flour 10mg. Allergy Advice: Contains No: gluten, lactose, wheat, added preservatives, artificial colouring. Suitable for vegans. Approved kosher. As a food supplement, take 1 or 2 capsules daily with a meal or as directed by a healthcare professional. Have always taken vitamin E capsules for skin and hair health. Can’t fault these, they work the same as other vitamin e supplements but its derived from ‘natural’ vegetable sources so its more bioavailable making it work faster in the body for faster results. My hair and skin always look healthy now that I take Vitamin E daily. Vitamin E is such a simple way to look my best every day. I love how my skin looks – so healthy and supple. Since I started taking these the severity of my eczema has decreased. This usually only happens with topical steroids so I am extremely happy right now that my skin looks so much better than usual. I take vitamin e for my health in general. The fact that my skin looks amazing is an added advantage.